Pascha (Greek: Πάσχα), also called Easter, is the feast of the Resurrection of the Lord. Pascha is a transliteration of the Greek word, which is itself a transliteration of the Aramaic pascha, from the Hebrew pesach meaning Passover. A minority of English-speaking Orthodox prefer the English word "Pasch." Pascha normally falls either one or five weeks later than the feast as observed by Christians who follow the Gregorian calendar. However, occasionally the two observances coincide, and on occasion they can be four weeks apart. The reason for the difference is that, though the two calendars use the same underlying formula to determine the festival, they compute from different starting points. The older Julian calendar's solar calendar is 13 days behind the Gregorian's and its lunar calendar is four to five days behind the Gregorian's. The Pascha date this year: April 28, 2019, next year: April 19, 2020, and May 2, 2021, the year after that. Sometime before midnight, on the Blessed Sabbath the Midnight Office service is chanted. In the Slavic practice, the priest goes to the tomb and removes the epitaphios and carries it through the Holy Doors and places it on the altar table where it remains for forty days until the day of Ascension. In the Byzantine practice, the epitaphios has already been removed (during the Lamentations Orthros on Holy Friday evening). Paschal matins begins with a procession that starts around midnight. The people leave the dark church building singing, carrying banners, icons, candles, and the Gospel. The procession circles the outside of the church and returns to the closed front doors. In Greek practice, the Gospel which tells of the empty tomb is now read. In Syrian practice, following the Gospel reading, the priest beats on the door and takes part in a dialogue with an interlocutor inside the church doors, crying out with the words of Psalm 23 (24): "Lift up your heads, O gates! And be exalted, you everlasting doors, that the king of glory may enter in!" In Slavic practice, neither of these rites is preserved. Next, the Paschal troparion is sung for the first time, together with the verses of Psalm 67 (68) which will begin all of the Church services during the Paschal season. So the sinners will perish before the face of God; but let the righteous be glad. and on those in the grave bestowing life. The doors are opened and the faithful re-enter. The church is brightly lit and adorned with flowers. It is the heavenly bride and the symbol of the empty tomb. The celebrants change to white vestments, the bright robes of the resurrection. The Easter icon stands in the center of the church, where the grave just was. It shows Christ destroying the gates of hell and freeing Adam and Eve from the captivity of death. There constant proclamation of the celebrant: Christ is risen! The faithful continually respond: Indeed he is risen! and censing of the icons and the people. O day of resurrection! Let us beam with God's own pride! Let everyone embrace in joy! Let us warmly greet those we meet and treat them all like brothers, even those who hate us! Let all the earth resound with this song: Christ is risen from the dead, conquering death by death, and on those in the grave bestowing life! Next, in some traditions, the Paschal Hours are also sung. At the conclusion, the celebrant solemnly proclaims the famous Paschal Sermon of St. John Chrysostom. This sermon is an invitation to all of the faithful to forget their sins and to join fully in the feast of the resurrection of Christ. Next, the Paschal Divine Liturgy begins with the singing once more of the festal troparion with the verses of Psalm 67 (68). The antiphons of the liturgy are special psalm verses that praise and glorify the salvation of God. Again, the troparion is repeated over and over. And the baptismal verse from Galatians: As many as have been baptized into Christ have put on Christ (Galatians 3:27) replaces the Thrice-Holy Hymn. The readings take the faithful back again to the beginning, and announces God's creation and re-creation of the world through the living Word of God, his Son Jesus Christ. The epistle reading is the first nine verses of the Book of Acts. The gospel reading is the first seventeen verses of the Gospel of John. It is customary on this day to read the Gospel in several languages. The Liturgy of St John Chrysostom continues as usual. Holy communion has, again and again, the troparion of the Resurrection. It is sung while the faithful partake. To Orthodox Christians, receiving communion on Easter Sunday is very important. Many parishes take the Paschal Sermon of St. John Chrysostom literally and commune all Orthodox Christians who are in attendance. To the Orthodox, the celebration of Pascha reveals the mystery of the eighth day. It is not merely an historical reenactment of the event of Christ's Resurrection. It is a way to experience the new creation of the world a taste of the new and unending day of the Kingdom of God. This new day is conveyed to the faithful in the length of the paschal services, in the repetition of the paschal order for all the services of Bright Week, and in the special paschal features retained in the services for the forty days until Ascension. Forty days are, as it were, treated as one day. Foods from which the faithful have been asked to abstain during the lenten journey are often brought in baskets and blessed by the priest. This may include eggs, cheese, meat, and a rich, cake-like bread, called Kulitch. These are then eaten after the Divine Liturgy. In Greek practice there is a lamb soup that is shared after the Liturgy. In Slavic practice, foods which were blessed earlier are shared. Another tradition at the feast of the Pascha, is the consecration of a bread stamped with the image of the Cross, or of the Resurrection, named Artos. This special Artos is consecrated at the close of the Paschal Liturgy in memory of the Risen Christ, Who is "the Bread of Life Eternal descended from Heaven and nourishing us with the food of His divine mercies." On the next Saturday, after the Liturgy, it is broken and distributed in the place of Antidoron. The faithful also sometimes exchange Red-dyed egg. The egg symbolizes the renovated life, received through the Blood of Christ. Some Orthodox Christians discourage the use of the word Easter, believing that the term has roots in pagan rites of the spring equinox and overtones of fertility. Most English speakers are unaware of the etymological origins of Easter, however, and use it without any sense of pagan connotations, and so Easter is also used by many Orthodox English speakers. The origin of the term Easter comes from the Germanic name for the month in which the Christian feast usually fell, and so, just as the American civic holiday of the Fourth of July has nothing to do with Julius Caesar for whom July was named, neither does Easter have anything to do with the pagan goddess Eostre, the namesake of the month in which Pascha fell. This potential difficulty only exists for speakers of Germanic languages, however. Most languages in the world use a cognate form of the Greek term Pascha and so are free of any pagan connotations for the name of the feast. In olden times the English people— for it did not seem fitting to me that I should speak of other nations' observance of the year and yet be silent about my own nation's— calculated their months according to the course of the Moon. Hence, after the manner of the Greeks and the Romans, [the months] take their name from the Moon, for the moon is called mona and each month monath. There is, however, a connection which may be drawn between the pre-Christian celebrations and the feast of the Resurrection of Christ. Just as Christ's incarnation is the ultimate fulfilment of the best hopes of all "natural" religion, so can Pascha be understood as being the ultimate springtime of mankind. The pre-Christian celebrations of the renewal of creation in the Spring find their completion in the Resurrection, the passage from death to life of the incarnate Son of God, and with him all creation. rolled away from the tomb. "Why do you seek among the dead as a man the One who is everlasting light? Behold the clothes in the grave! Go and proclaim to the world: The Lord is risen! saving the race of men." Thou didst destory the power of death! and bestowing resurrection to the fallen. The angel cried to the Lady Full of Grace: Rejoice, O Pure Virgin! Again I say: Rejoice! Your Son is risen from His three days in the tomb! With Himself He has raised all the dead! Rejoice, all you people! Shine! Shine! O New Jerusalem! The Glory of the Lord has shone on you! Exalt now and be glad, O Zion! Be radiant, O Pure Theotokos, in the Resurrection of your Son! 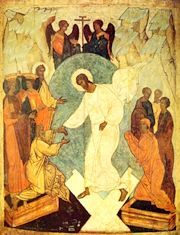 HOLY PASCHA The Resurrection of Our Lord from OCA website. This page was last edited on June 12, 2017, at 21:41. This page has been accessed 309,504 times.